A wild explosion of green broadcasted a message of recovery from the hilltops of St. Martin this winter. Hurricane Irma battered and bruised, but the tropical sun and wet season rains were like a green machine. The island was still alive. Six months later, a closer look reveals a more complicated situation. Not all parts of the island have recovered equally and some remain devastated. 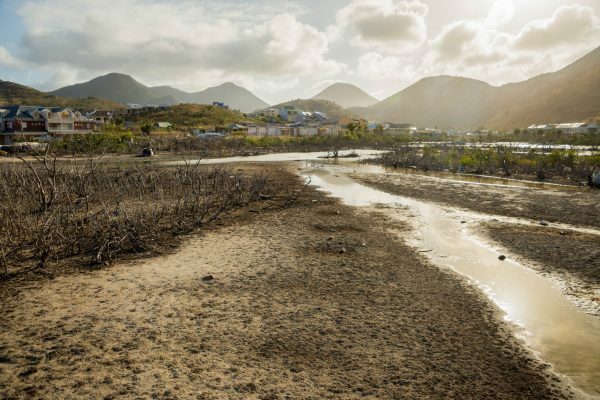 Ecosystems are complex, and each type of habitat on St. Martin has its own vulnerabilities. One thing we do know is that we desperately need a recovery. 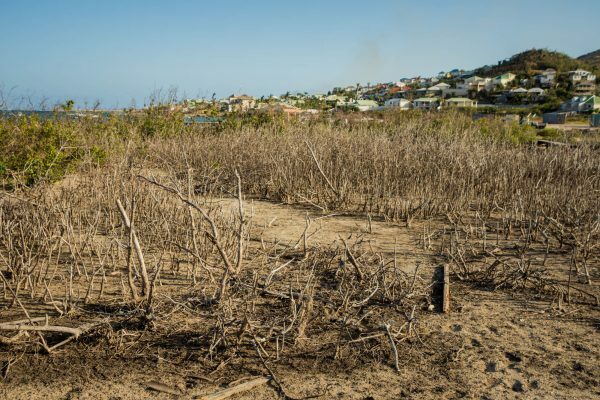 Mangrove wetlands offer key protection from storm surge and erosion. They can save lives and property in a Hurricane, but they also protect the island from slowly washing into the sea. It’s one ecosystem we literally can’t live without. A barren and desolate wetland in French Cul-de-sac. Some areas were on the edge of health—or even in the process of collapsing—even before Irma. Mangrove trees around many ponds have been dying for five years, a process that seemed to speed up during the drought a few years ago. Like a house that was already crumbling and termite-ridden, Irma tore up these wetlands and they are not yet recovering. Étang de la Barrière in French Cul-de-sac was a magical spot for birdwatching just a few years ago. A gorgeous boardwalk was built through the mangroves so people could watch egrets, stilts and whimbrels catch fish and fiddler crabs. Today the boardwalk is damaged, but the ecosystem that it showcased is almost totally destroyed. This sea of dead trees was once rich with life. What will happen to this spot? What will happen to the many other places where bare, dead trees line the banks of St. Martin’s ponds? I think it is hard to say, especially because we don’t know exactly why they are in such desperate shape. Human activity probably harmed them: pollution and simply cutting back mangroves until only a thin thread remained. The drought of 2015 seems to have made things worse. Irma’s winds and waves were perhaps just the final push over the cliff. With the possibility of drought forecast for the region this year, who knows when a recovery might begin.